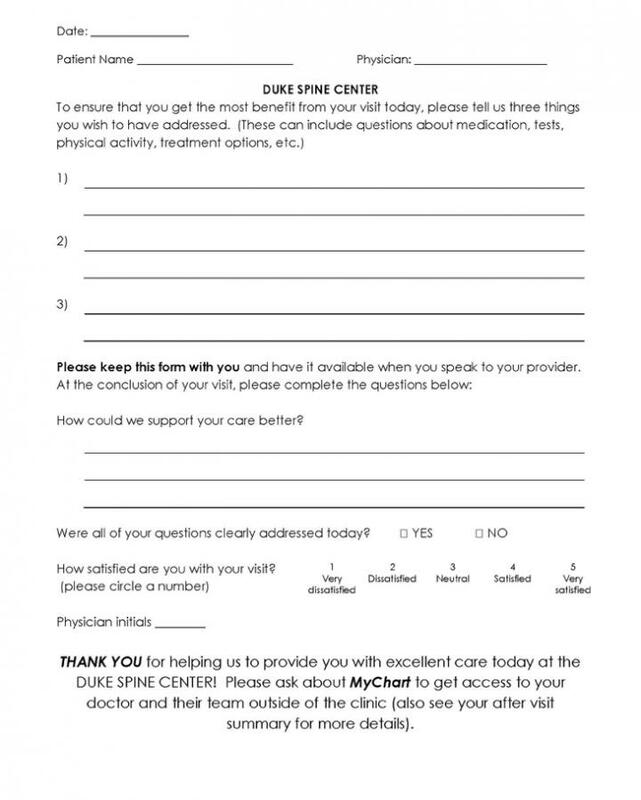 The low-tech tool, which asks for a list of the topics patients wants to discuss during their visit, helps patients focus on what's important to them. It also asks if all their questions were addressed at the end of the visit and if they were satisfied, giving doctors real-time feedback on how well they're addressing their patients' concerns. "National surveys show that up to half of all patients leave the clinic visit with an unvoiced need," said Oren Gottfried, M.D., clinical vice chair for quality in the Department of Neurosurgery at Duke University School of Medicine and lead author of a study published this week in the journal Neurosurgery. "In a typical visit, patients might forget or not articulate all of their concerns, due to being intimidated by the doctor's office or doctor, feeling anxious or rushed, or not knowing how to share or voice their questions," Gottfried said. "These miscommunications and missed opportunities can affect care and patient safety." The Duke survey was more direct, and it provided immediate feedback. It also became part of a broader analysis that gave physicians and their practices a way to track progress. The tool worked. Its success was validated by improved global rating scores for physicians on the government's CG-CAHPS survey, and improved patient satisfaction. "From a patient standpoint, this simple tool helps them feel and know their doctor is listening to them and addressing their concerns," Gottfried said. "From a physician standpoint, it very clearly tells them their patients' goals, which means everyone's time is used effectively. And doctors, like anyone, appreciate real-time feedback, including positive comments from patients." "This is all about patient satisfaction, patient-doctor communication, and doctor satisfaction," Gottfried said. "In the end it boils down to being more patient-centric, and that's what health care should be about."